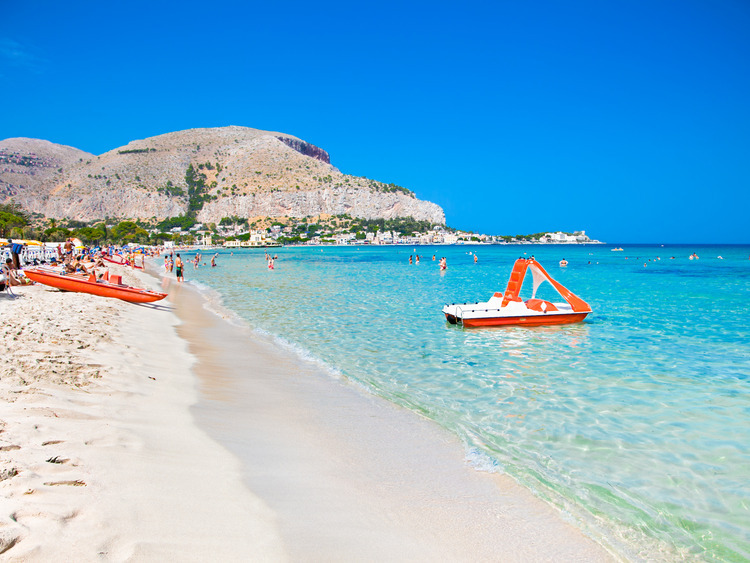 We will spend a relaxing day on the beautiful Mondello beach, a delightful tourist location close to Palermo. The return coach trip will let us admire some of the most beautiful and important sights of Palermo city centre. We will take the coach to Mondello beach, a well-known tourist destination on the outskirts of Palermo, adored for its crystal waters and fine white sands. On the way to Mondello, we will take the coastal roads of Palermo and cross the beautiful Parco della Favorita. This enchanting park has an interesting history. It is said that Ferdinand III of Sicily fled from Naples with his wife Marie Caroline in 1798, following the Neapolitan Revolution, and took refuge in Palermo. Here, wanting to cultivate his interest in hunting, he purchased a farm of roughly 400 hectares on the side of Monte Pellegrino and he named this immense park the Reale Tenuta della Favorita. Once we reach Mondello, we will head for the beach resort and settle ourselves on the sunbeds under the umbrellas to enjoy some free time on the sand. On our return we will cross the Parco della Favorita again and then the city centre: we will travel along Via della Libertà (considered the city's most important street due to its size, the elegance of its stores and its tree-lined appearance) and admire the Teatro Politeama (the city's main theatre, built in the 19th century), Via Ruggero Settimo (named in honour of admiral and senator Ruggero Settimo, and known as Palermo's 'sitting room' due to the elegance of its shops) and the Teatro Massimo (Palermo's Operatic Theatre, built at the end of the 19th century in neoclassical style).